Or maybe someone (like one of us crazy personal finance bloggers) said that you can pick up some extra cash unloading some of your unused junk on eBay. It’s a nice thought, right? Get rid of something you’re not using, pocket the cash. Well, something along those lines happened to me. Sort of. Warning: If the title of this post grossed you out, you’re probably not going to like the rest of what follows. Especially the fact that there are pictures. Don’t say I didn’t warn you! Huh? What? You Sold WHAT on eBay? 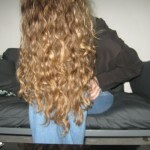 My hair. See, what originally happened is that I decided to take my hair from long (three-quarters of the way down my back) to shortish (just below my ears) – and to donate, instead of discarding, the cut-off hair. 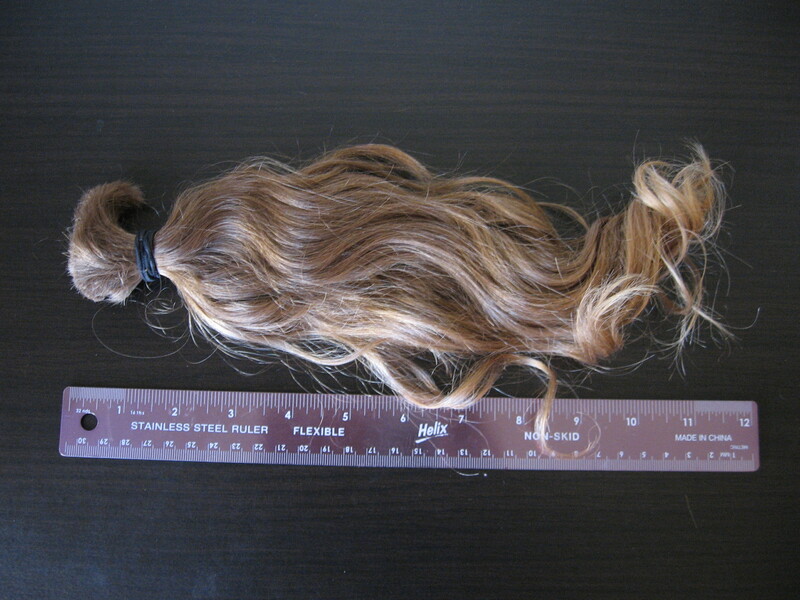 I kept the sawed-off ponytail, with the intention of donating it to Locks of Love. When I did a Google search to find out how to send my hair in, however, I found that there is some controversy out there regarding Locks of Love. Unable to pin down exactly the right place to donate my hair to (at that time), I started researching the alternative: selling it. At first, I was a little discouraged. Though long enough to meet most requirements, my hair has what some websites designated as a “fatal flaw:” it’s curly. 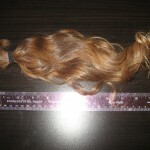 Straight hair is, according to many online guides to hair selling, the most sought-after and highly-priced type of hair. So with my ponytail in hand, I logged on to make my first-ever eBay listing. First, I considered the fact that there are sites dedicated solely to the listing of hair for sale – sort of eBay or Craigslist specifically for hair. But these sites charge you money to list your hair, and since this isn’t likely to be something I do very often, I felt that the no-cost initial listing of eBay was the best bet. One of the things Karen Shelton’s post addressed was the risk of not getting paid for your hair, with some services. This is the reason I decided to use eBay and take only PayPal as payment, since PayPal offers some protection for sellers that you would not get by accepting a personal check or money order. Another thing Shelton’s article pointed out was that hair with a “natural wave” in it might actually garner some real attention and cash, so I went for it. I took several pictures of the ponytail of hair itself, next to a ruler (to demonstrate the length), one in indirect sunlight and one with the camera flash, to give a good idea of the color. One thing that I also had was a picture (that didn’t show my face) of how the hair had looked on my head, immediately before I cut it. It was a coincidence that I even had the photo, but it worked out well – I think people buying hair want to see it in its natural environment. 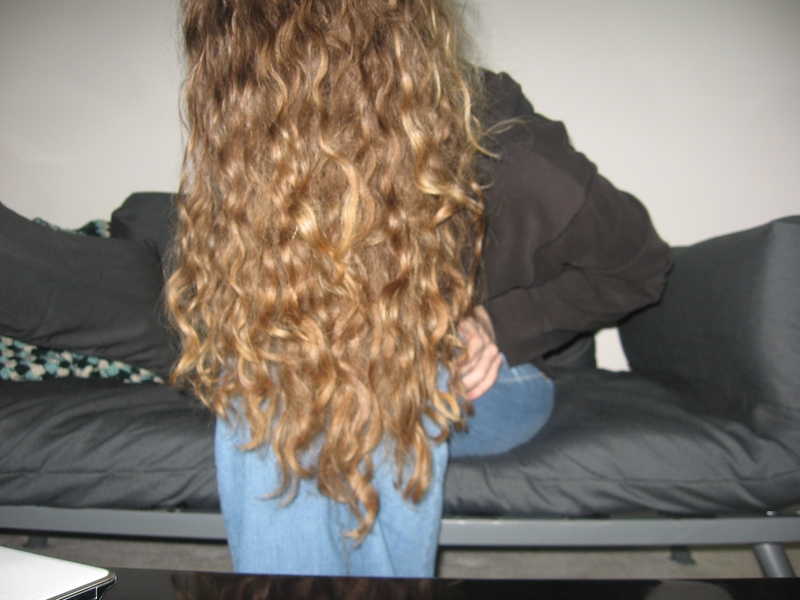 With these pictures, I wrote up a detailed description of my hair, its length, its color, and all the attributes that I listed about (undyed, no chemicals, etc.) 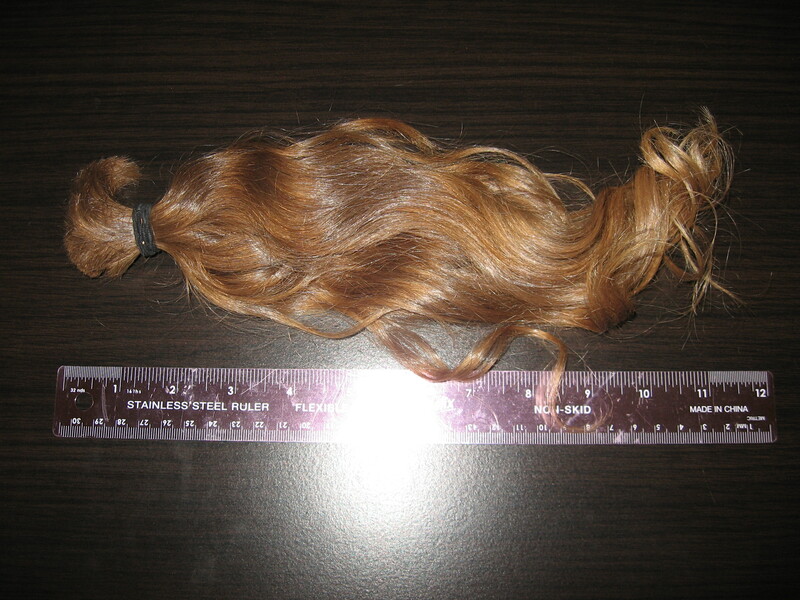 and put it up on eBay with the title “11″ Ponytail of Honey Blonde Curly/Wavy Human Hair” and an opening bid of just $0.99. Why 99 cents? Because it was an experiment, first and foremost. More than making money off it, I wanted to see how high it might go. There were a few bids in the first few days – getting the price up into the teens. I was pretty pleased with that – it seemed like it was at least going to be worth my while to have listed it, considering the hair itself was something I “got for free.” That’s the nice thing about selling your hair – it’s almost 100% pure profit! There were a few people who had put the listing on their “watch list,” and for the next few days, nothing happened. Then suddenly, as my listing neared its end, the bids began to shoot up dramatically (nothing out of the ordinary for an online auction!). The winning bid when it closed was $166.50! From that, $5.13 went to PayPal fees, and $5.34 for shipping via eBay’s partnership with the US Postal Service. So for my trouble of keeping the ponytail, photographing it, listing it, and shipping it (maybe two hours of work, tops? ), I got a cool $156.03. All-in-all, I was pretty happy with the experience. The only downside was that a few people in my personal life were grossed out by the concept – my boyfriend/now-fiancé was especially not happy about having the disembodied ponytail in the apartment! The “catch” is that I can really only grow my hair long enough for this every two years or so. It’s actually been almost two years since this particular incident happened (took me a while to write about it, obviously! ), so I could do it again soon, if I wanted. But you have to really want to cut your hair and sell it for this to work. Since my wedding is coming up later this year, that’s not a position I’m in right now. But who knows, maybe as soon as the wedding is done, I’ll chop my ponytail off once again and sell it to recoup some wedding costs! Did you pay final value fees on eBay as well? Your hair sold for a premium (and God help me because I have experience in this) because it was naturally blond, virgin, wavy but not curly hair originating locally. The only hair that might command more money is if it were for a Jewish wig. Good job on making some moolah. Unfortunately because it was 2 years ago when I made this sale, it looks like I can’t access my eBay records for it to see if there was a fee from eBay on the final value. If there was, they took it out before the payment got to me, which means the winning bid was actually higher than $166.50! I wish I knew – unfortunately at this point, all I have are my own PayPal and bank account records. So I know the final “take-home” amount for me was $156.03. Which section did you put your hair on? I’m contemplating. And would you suggest to start the bid higher? .99cents just seems that you might not get more at the end. I can’t remember now (since it’s been 4 years) which section I put it on – I believe I did a search for human hair on eBay to see where other people were generally putting theirs, and picked a section that seemed good and had many listings for other human hair. If I were to do it again, I would start the bidding at 99 cents again. Though there is always a risk you might not get much, I think a low start gets attention and gets a lot of people to watch the auction, which is what drives the price up. If you set the starting bid too high, you might not get any bids (and have to relist later, costing time and money), or you might only get one interested bidder. I always go into eBay (the few times I’ve used it, anyway) with the thought that starting at 99 cents works best for me, but I am also always willing to part with the items for a low amount if that’s what ends up happening. I believe in the strength of my writing and pictures (aka my ability to craft a good listing) to fetch a good price for me in the end. 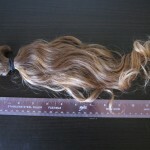 The final value fees on Ebay are usually about 10%, which meant it was cheaper for me to sell my hair through Hairsellon (http://hairsellon.com/) , but I remember also going through the process of looking at donating. Interesting! Did you find that you fetched a higher price on Hairsellon (or, at least, 90%+ of what you might have got on eBay)? I definitely agree that it made more sense (for me) to sell the hair and then choose to donate money to charity on my own. Much clearer who gets the benefits that way! It’s difficult to say because I didn’t list it on Ebay, but I got just over $350, and the fee was $12, whereas it would have been $35+ with Ebay. The system is different, it is closed bids on Hairsellon, you set the price and people make offers privately, as oppose to bidding.